Spectacular ocean front unit that has a huge WOW factor. This newly decorated condo, is spacious and designed with the traditional island tropics in mind. This unit can sleep four to six people. Located on the popular Alii Drive our TRUE OCEANFRONT condominium looks out to Kailua Bay and beyond. From the Lanai you can watch cruise ships tender their passengers to Kailua Pier. Watch the whales, dolphins and the night lights of Kailua-Kona from your lanai. Unit 4213 is right on the Ocean and is away from the parking lot on the second floor so there is very little noise. This unit has all brand new furnishings, 40" tv and kitchen hardware. Sea Village has wireless internet available to all users at no additional charge. The master bedroom with the ensuite has a queen size bed while the second bedroom has two twin beds. The kitchen has a dishwasher, fridge, range, microwave and washer/dryer. The complex has an Ocean front swimming pool and jacuzzi hot tub with lounge chairs and umbrella tables. There is also spacious rolling lawns with picnic tables and gas BBQ'S. There is also tennis courts for everyone's use. The Green Flash Coffee Shop is conveniently located in the front of the complex serving the famous Kona Coffee. From this spectacular condo you can walk to beaches, and the historic Kailua-Kona village about 1 mile away. Kona features great luau's, art galleries and jewelry shops, restaurants and pubs, dancing, water sports, boating, snorkeling, scuba diving, surfing, boogie boarding and deep sea fishing as well as just about every water sport you can think of. Plus there are many great golf courses near by. RATES: A one-time cleaning/maintenance fee of $150.00 will be made. Half-day arrangements must be made at the time of registration. NOTE: Major holidays and special events rates are 10% higher and require a minimum 7 night stay. On location and scenic value alone I have to give this condo 5 stars. Add to the true oceanfront views the fact that the condo was clean and well equipped and you have the perfect formula for a great place to stay. The grounds at Sea Village are meticulously cared for, staff were seen cleaning and pruning the gardens daily, beyond what one might expect. With the ocean literally 30 feet away we watched whales, dolphins, tropical fish and even a large manta ray right from our lanai! Many beautiful beaches are very close by with great boogie boarding and lots of frollicking for the kids. In sixteen days we were able to see lots of the Big Island and it was nice to come home every night to our unit in Sea Village - it truly felt like a restful end to many busy days. 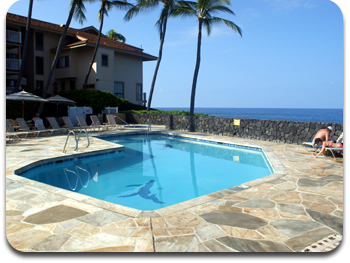 I would not only reccomend this unit I would like to say now that we will likely return to Kailua-Kona and when we do we would be very pleased to call Sea Village our home for our stay. As an aside, if you travel to Kona be sure to make U-Top-It a lunch destination for at least one of your meals out, a unique spin on a crepe shop with exceptional dessert crepes and hefty portions! Great ocean view of sunsets, dolphins and whales and boating activity Very niice and adequate furnishings. Bedspreads are really pretty. Furniture is attractive, too. WiFi works well. Kitchen is well stocked with pots, pans dishes, utencils, etc. Linens are in excellent supply. We hope to come back again! 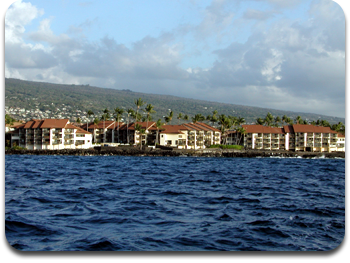 Excellent stay at Kona Sea Village, on Alii Drive, great accomodation, conveniently located and right on the waterfront, watch the cruise ships, with fantastic views, of harbour, sea life, dolphins, sunsets and marine life! Very relaxing with the waves crashing on the shore Very highly recommended, and the owners are very accomodating, and friendly! Definately going back again shortly!